I was born Jewish. My father was born Jewish. My mother was born a Southern Baptist but converted to Judaism prior to marrying my father, so I was born Jewish. Being Jewish is passed through the mother not the father. You might wonder why, (as I did), Jewishness is passed through the mother and not the father. Of course until recent scientific advances in the 1980’s and 1990’s one could not prove paternity with over 90% accuracy, and it was the woman’s word against the man’s word. However, these days with DNA testing being 99.9% accurate, their is little doubt about paternity if someone really wants to find out who is the “baby daddy”. Being a Jew is passed through the mother because being Jewish is not about our DNA it is about our soul. According to Jewish custom the mother shapes the soul of a baby more than the father does. That is because of the physical connection between the mother and baby while the mother is carrying the child. The mother conceives the child, grows the child, feeds the child, removes it’s waste inside her own body, nourishes the child, and delivers the child to the world through her body. The father’s is involved in creation of the child, but once the baby is conceived the father’s physical presence is external, and therefore distant. All that being said, I married a Christian man, and we made two beautiful babies. I had been told by my mother that Jewishness is passed down by the mother, (which is why she converted prior to having children), but I didn’t know how important that would become to me in the future. While I was married to my husband we practiced Christianity because I was a “good wife” and let my husband dictate the spirituality of the family. However, I never stopped hanging onto my “Jewishness”. I always lit my Hanukkah candles with the menorah given to me when I was 16. 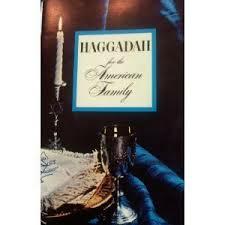 I even talked my husband into participating in a Passover Seder dinner or two during our marriage. I always had him nail my Mezuzah (given to me by my father and mother) to the door frame of our home. I suppose although externally I was being a “good” wife, internally I was going kicking and screaming, hanging onto whatever semblance of Jewishness I could. 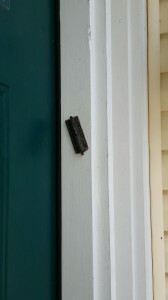 The Mezuzah I have been carrying with me for 30 years. 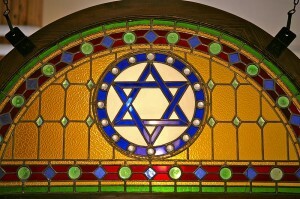 In the past few years I have begun to reclaim my Jewishness and my Jewish heritage. About 4 years ago I started having a Passover Seder with my family. The first year I went all out, making potato Kugel, a brisket, and even forcing my family to eat gefilte fish. (I actually can’t stand gefilte fish, but I remember my mother “forcing” us to eat “just a bit of it” during the Seder’s I attended as a child.) So I forced my family to eat it also. That only lasted one year…. We don’t have gefilte fish anymore. The negotiations have definitely gotten more elaborate as the kids have gotten older. I used to be able to pay the ransom with chocolate to the younger two and a big bag of sour patch kids to the oldest boy. Now it is about money and CDs and lots of other things they dream about. I think they have strategy talks while they are searching for the Afikomen every year. My desire to reclaim my Jewish heritage has gotten stronger and stronger as I have aged. It is so important to me to pass this heritage on to my children. They both know they are Jewish. They know some of the traditions: Hanukkah, Passover, Rosh Hashanah, Yom Kippur. I plan on using the next couple of years to teach them as much as I can before they leave my home to enter the world on their own. To ingrain their Jewishness in them enough that even if they don’t embrace it while they are young the seeds will be planted and I can hope they will grow and mature over the years so they will claim their Jewishness in their own lives! In fact, I think We will be watching The Exodus as a family on Saturday so they can get a more clear picture of how Israel came into being. I am sure they will be bored but I will bribe them with popcorn and homemade brownies and soda. Make yummy snacks and they will come…..
Reclaiming my Jewishness is vitally important to me. Instilling Jewish Heritage, and tradition into my kids is my mission. They are Jewish! 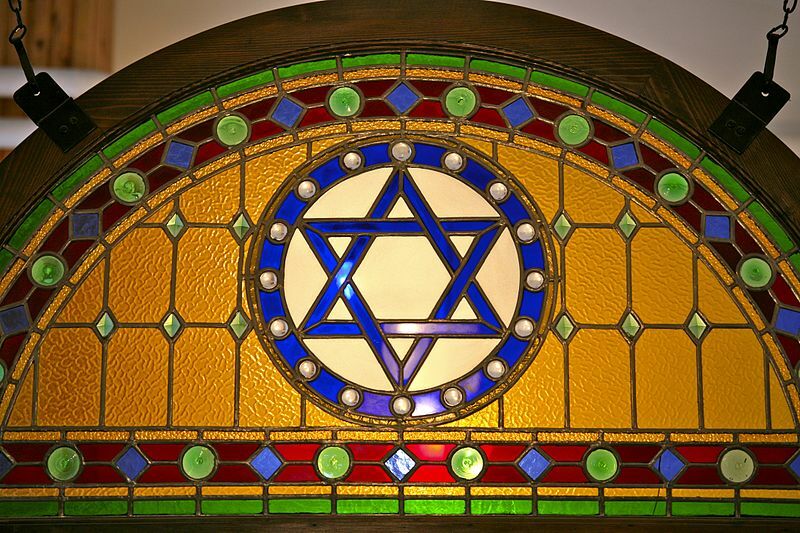 Being Jewish isn’t about religion, it is about our souls. I agree with you. I was born Jewish but stopped believing in God at a very young age. I am more traditonally Jewish and most importantly I identify with being Jewish. But I don’t do any ceremonies or celebrations anymore. My sons had Bar Mitzvahs because it was easy as they were at Jewish Day schools for a time in their school history. They learned Hebrew so Hebrew school was one day a week and they just stayed at school. They both married Jewish women and celebrate the holidays. My grandkids know they are Jewish but probably will not have Bar or Bat Mitzvahs but one never knows. Thank you for sharing your story. It is so important to pass traditions on to the next generation.